MapsofWorld.com explores the world's most commonly spoken languages in its recent series, “Tongues of the World.” The collection combines informative articles with infographics, discussing the characteristics of world languages, including major languages and many regional languages. Tongues of the World is a guide for travelers, students, and casual linguists, and has been well received by members of these communities. 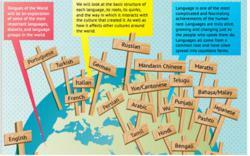 MapsofWorld’s recent series, Tongues of the World, is an educational guide to the world of languages. Featuring every major language, the collection traces the origins and development of each language, as well as cultural adaptations, dialects, and oral traditions. The educational series explains linguistic terms, and discusses the challenges surrounding accurately estimating the number of speakers of each language. Tongues of the World presents this complex topic in a way that is easy to understand, complete with infographics. Tongues of the World features detailed articles on the most widely spoken languages of the world, such as English, French, Chinese, Spanish, Japanese, German, Hindi, Tamil, as well as regional languages, including Persian, Urdu, Malay, Russian, Vietnamese, Swahili, Marathi, and Turkish. The articles also explore the importance of language as a cultural vehicle and the relationships between language and community identity. Tongues of the World is a guide for travelers, students, and casual linguists, and has been well received by members of these communities. The site also features creative infographics to accompany each article as a bonus for those who prefer the visual representation of information. MapsofWorld.com is a multilingual portal offering high-quality maps and information across geographies and platforms. With special focus on educational content, the portal has thematic as well as interactive maps on all major platforms: Web, iPhone, iPad, iPod, and Android. World Atlas and World Quiz are two highly successful educational apps from MapsofWorld.com that have been downloaded over 100,000 times to date. Other services offered are custom mapping, content digitization, and the online map store.